You can help monarchs! Iowa’s location within the monarch breeding range makes it possible for Iowa to lead the way in monarch conservation efforts. Consider adding monarch habitat to your property. 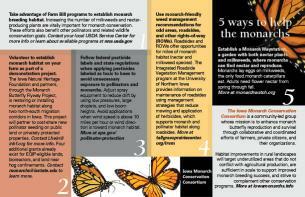 Learn how to begin with our "Habitat How To" resource list. The Iowa Monarch Conservation Consortium recommends five actions to help the monarch population recover from recent declines. Take advantage of the Farm Bill programs to establish monarch breeding habitat. The Iowa State Monarch Research team seed mix recommendations can be found here. Establish a monarch waystation – with host plants for larvae and plants that are energy sources for adults. Use habitat management practices to maintain existing habitat in odd areas, roadsides and other right-of-ways. Follow federal pesticide labels and state regulations. Volunteer to participate in habitat demonstration projects or citizen science monitoring. Learn more about Iowa's habitat goals to support monarch population recovery in this summary of the Iowa Monarch Conservation Strategy. The full version of the strategy is available here. Share these goals with your organizations! You are welcome to print and distribute these resources. If you wish to start establishing monarch habitat now, the following are examples of some of the organizations that provide information on establishing monarch, pollinator or wildlife breeding habitat.